This article is about the .50 caliber M2 machine gun. For the Browning .30-06 machine gun, see M1919 Browning machine gun. The M2 Machine Gun or Browning .50 Caliber Machine Gun is a heavy machine gun designed toward the end of World War I by John Browning. Its design is similar to Browning's earlier M1919 Browning machine gun, which was chambered for the .30-06 cartridge. The M2 uses the much larger and much more powerful .50 BMG cartridge, which was developed alongside and takes its name from the gun itself (BMG standing for Browning Machine Gun). It has been referred to as "Ma Deuce", in reference to its M2 nomenclature. The design has had many specific designations; the official designation for the current infantry type is Browning Machine Gun, Cal. .50, M2, HB, Flexible. It is effective against infantry, unarmored or lightly armored vehicles and boats, light fortifications and low-flying aircraft. Current: General Dynamics, Fabrique Nationale (FNH / FNA / FNHUK), Ohio Ordnance Works Inc. and U.S. Ordnance. 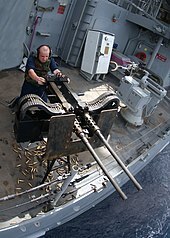 The Browning .50 caliber machine gun has been used extensively as a vehicle weapon and for aircraft armament by the United States from the 1930s to the present. It was heavily used during World War II, the Korean War, the Vietnam War, the Falklands War, the Soviet–Afghan War, the Gulf War, the Iraq War and the War in Afghanistan in the 2000s and 2010s. It is the primary heavy machine gun of NATO countries, and has been used by many other countries as well. The M2 has been in use longer than any other firearm in U.S. inventory except the .45 ACP M1911 pistol, also designed by John Browning. Machine guns were heavily used in World War I, and weapons of larger than rifle caliber began appearing on both sides of the conflict. The larger rounds were needed to defeat the armor that was being introduced to the battlefield, both on the ground and in the air. During World War I, the Germans introduced a heavily armored airplane, the Junkers J.I. The armor made aircraft machine guns using conventional rifle ammunition (such as the .30-06) ineffective. Consequently, the American Expeditionary Force's commander General John J. Pershing asked for a larger caliber machine gun. Pershing asked the Army Ordnance Department to develop a machine gun with a caliber of at least 0.50 inches (12.7 mm) and a muzzle velocity of at least 2,700 feet per second (820 m/s). U.S. Col. John Henry Parker, commanding a machine gun school in France, observed the effectiveness of a French 11 mm (0.43 in) incendiary armor-piercing round. The Army Ordnance Department ordered eight experimental Colt machine guns rechambered for the French 11 mm cartridge. The French 11 mm round was found to be unsuitable because its velocity was too low. Pershing wanted a bullet of at least 670 gr (43 g) and a muzzle velocity of 2,700 ft/s (820 m/s). Development with the French round was dropped. Around July 1917, John M. Browning started redesigning his .30-06 M1917 machine gun for a larger and more powerful round. Winchester worked on the cartridge, which was a scaled-up version of the .30-06. Winchester initially added a rim to the cartridge because the company wanted to use the cartridge in an anti-tank rifle, but Pershing insisted the cartridge be rimless. The first .50 machine gun underwent trials on 15 October 1918. It fired at less than 500 rounds per minute, and the muzzle velocity was only 2,300 ft/s (700 m/s). Cartridge improvements were promised. The gun was heavy, difficult to control, fired too slowly for the anti-personnel role, and was not powerful enough against armor. While the .50 was being developed, some German T Gewehr 1918 anti-tank rifles and ammunition were seized. The German rounds had a muzzle velocity of 2,700 ft/s (820 m/s), an 800 gr (52 g) bullet, and could pierce[clarification needed]1 in (25 mm) at 250 yd (230 m). Winchester improved the .50 caliber round to have similar performance. Ultimately, the muzzle velocity was 2,750 ft/s (840 m/s). Efforts by John M. Browning and Fred T. Moore resulted in the water-cooled Browning machine gun, caliber .50, M1921. An aircraft version was termed the Browning aircraft machine gun, caliber .50, M1921. These guns were used experimentally from 1921 until 1937. They had light-weight barrels and the ammunition fed only from the left side. Service trials raised doubts whether the guns would be suitable for aircraft or for anti-aircraft use. A heavy barrel M1921 was considered for ground vehicles. John M. Browning died in 1926. Between 1927 and 1932, S.H. Green studied the design problems of the M1921 and the needs of the armed services. The result was a single receiver design that could be turned into seven types of .50 caliber machine guns by using different jackets, barrels, and other components. The new receiver allowed right or left side feed. In 1933, Colt manufactured several prototype Browning machine guns (including what would be known as the M1921A1 and M1921E2). With support from the Navy, Colt started manufacturing the M2 in 1933. FN Herstal (Fabrique Nationale) has manufactured the M2 machine gun since the 1930s. General Dynamics, U.S. Ordnance and Ohio Ordnance Works Inc. are other current manufacturers. A variant without a water jacket, but with a thicker-walled, air-cooled barrel was designated the M2 HB (HB for Heavy Barrel). The added mass and surface area of the heavy barrel compensated somewhat for the loss of water-cooling, while reducing bulk and weight: the M2 weighs 121 lb (55 kg) with a water jacket, but the M2 HB weighs 84 lb (38 kg). Due to the long procedure for changing the barrel, an improved system was developed called QCB (quick change barrel). The lightweight "Army/Navy" prefixed AN/M2 "light-barrel" version of the Browning M2 weighing 60 pounds (27 kg) was also developed, and became the standard .50-caliber aviation machine gun of the World War II-era for American military aircraft of nearly every type, readily replacing Browning's own air-cooled .30 caliber machine gun design in nearly all American aircraft installations. The Browning M2 is an air-cooled, belt-fed machine gun. The M2 fires from a closed bolt, operated on the short recoil principle. The M2 fires the .50 BMG cartridge, which offers long range, accuracy and immense stopping power. The closed bolt firing cycle made the M2 usable as a synchronized machine gun on aircraft before and during World War II, as on the early versions of the Curtiss P-40 fighter. The M2 is a scaled-up version of John Browning's M1917 .30 caliber machine gun, even using the same timing gauges. The M2 has varying cyclic rates of fire, depending on the model. The M2HB (heavy barrel) air-cooled ground gun has a cyclical rate of 450–575 rounds per minute. The early M2 water-cooled AA guns had a cyclical rate of around 450–600 rpm. The AN/M2 aircraft gun has a cyclic rate of 750–850 rpm; this increases to 1,200 rpm for AN/M3 aircraft guns. These maximum rates of fire are generally not achieved in use, as sustained fire at that rate will wear out the bore within a few thousand rounds, necessitating replacement. In addition to full automatic, the M2HB can be selected to fire single-shots or at less than 40 rounds per minute, or rapid fire for more than 40 rounds per minute. Slow and rapid firing modes use 5–7 round bursts with different lengths of pause between bursts. The M2 has an effective range of 1,830 metres (2,000 yd) and a maximum effective range of 2,000 metres (2,200 yd) when fired from the M3 tripod. In its ground-portable, crew-served role as the M2HB, the gun itself weighs 84 pounds (38 kg) and the assembled M3 tripod another 44 pounds (20 kg). In this configuration, the V-shaped "butterfly" trigger is located at the very rear of the weapon with a "spade handle" hand-grip on either side of it and the bolt release in the center. The spade handles are gripped and the butterfly trigger is depressed with one or both thumbs. Recently, new rear buffer assemblies have used squeeze triggers mounted to the hand grips, doing away with the butterfly triggers. When the bolt release is locked down by the bolt latch release lock on the buffer tube sleeve, the gun functions in fully automatic mode. Conversely, the bolt release can be unlocked into the up position resulting in single-shot firing (the gunner must press the bolt latch release to send the bolt forward). Unlike virtually all other modern machine guns, it has no safety (although a sliding safety switch has recently been fielded to USMC armorers for installation on their weapons and is standard-issue for the U.S. Army for all M2s). Troops in the field have been known to add an improvised safety measure against accidental firing by slipping an expended shell casing under the butterfly trigger. The upgraded M2A1 has a manual trigger block safety. Because the M2 was designed to operate in many configurations, it can be adapted to feed from the left or right side of the weapon by exchanging the belt-holding pawls, and the front and rear cartridge stops (three-piece set to include link stripper), then reversing the bolt switch. The operator must also convert the top-cover belt feed slide assembly from left to right hand feed as well as the spring and plunger in the feed arm. This will take a well trained individual less than two minutes to perform. The charging assembly may be changed from left to right hand charge. A right hand charging handle spring, lock wire and a little "know-how" are all that are required to accomplish this. The M2 can be battle-ready and easily interchanged if it is preemptively fitted with a retracting slide assembly on both sides of the weapon system. This eliminates the need to have the weapon removed from service to accomplish this task. At some point during World War 2 the Frankford Arsenal developed a squeeze bore version of the M2HB which reduced the bullet size from .50 to .30 caliber. Current ammunition types include M33 Ball (706.7 grain) for personnel and light material targets, M17 tracer, M8 API (622.5 grain), M20 API-T (619 grain), and M962 SLAP-T. The latter ammunition along with the M903 SLAP (Saboted Light Armor Penetrator) round can perforate 1.34 inches (34 mm) of FHA (face-hardened steel plate) at 500 metres (550 yd), 0.91 inches (23 mm) at 1,200 metres (1,300 yd), and 0.75 inches (19 mm) at 1,500 metres (1,600 yd). This is achieved by using a 0.30-inch-diameter (7.6 mm) tungsten penetrator. The SLAP-T adds a tracer charge to the base of the ammunition. This ammunition was type classified in 1993. When firing blanks, a large blank-firing adapter (BFA) of a special type must be used to allow the recoil operated action to cycle. This functions on the principle of a recoil booster, to increase the recoil force acting on the short recoil action. This is the exact antithesis of a muzzle brake. Without this adaptor, the reduced-charge blank cartridge would develop too little recoil to cycle the action fully. The adapter is very distinctive, attaching to the muzzle with three rods extending back to the base. 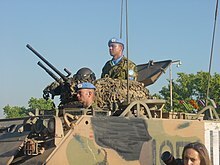 The BFA can often be seen on M2s during peacetime operations. An M2 fired from a rigid-hulled inflatable boat. As a light anti-aircraft (AA) gun in some ships; up to six M2 guns could be mounted on the same turret. As an anti-aircraft gun on the ground. The original water-cooled version of the M2 was used on a tall AA tripod or vehicle-mounted anti-aircraft weapon on a sturdy pedestal mount. 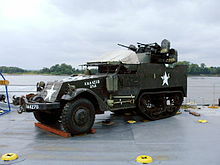 In later variants, twin and quadruple M2HB Brownings were used, such as the M45 Quadmount (aka "meat chopper") used on the US M16 half-track carrier. Twin or quad-mount .50 M2 guns normally used alternating left-hand and right-hand feed. Primary or secondary weapon on an armored fighting vehicle. Primary or secondary weapon on a naval patrol boat. Spotting for the primary weapon on some armored fighting vehicles. Secondary weapon for anti-boat defense on large naval vessels (corvettes, frigates, destroyers, cruisers, etc.). Coaxial gun or independent mounting in some tanks. Fixed-mounted forward-firing primary aircraft armament (AN/M2 and AN/M3 light-barrel versions only). The AN/M2 was used as primary armament in almost all World War II U.S. pursuit aircraft (such as the North American P-51 Mustang, Republic P-47 Thunderbolt, Lockheed P-38 Lightning, Bell P-39 Airacobra, Curtiss P-40 Warhawk, Grumman F6F Hellcat and Vought F4U Corsair). It was also used in fixed mountings in bombers and ground attack aircraft like the Douglas SBD Dauntless dive bomber, Grumman TBF Avenger torpedo bomber, and medium bombers such as North American B-25 Mitchell, Martin B-26 Marauder and Douglas A-26 Invader; usually 4–8 per aircraft but the bombers could mount 12 or more in certain configurations. The later, faster-firing electrically feed-boosted AN/M3 was used in many Korean War-era U.S.A.F. fighter aircraft such as the Lockheed F-80 Shooting Star, Republic F-84 Thunderjet, North American F-86 Sabre, and early versions of the Martin B-57 Canberra bomber. The US Navy had largely completed their move to the (unrelated) M2/AN 20mm autocannon for aircraft armament by this time. Turret-mount or flexible-mounted defensive armament, again only with the AN/M2 light-barrel version, in almost all US World War II-era bombers and patrol aircraft such as the Boeing B-17 Flying Fortress, Consolidated B-24 Liberator and Boeing B-29 Superfortress heavy bombers, North American B-25 Mitchell and Marin B-26 Marauder medium bombers, Consolidated PBY Catalina patrol flying boats, Grumman TBF/TBM Avenger torpedo bombers, and in a combined offensive/defensive turret mounting in many Northrop P-61 Black Widow night fighters. The AN/M3 was used as a flexible, quad-mounted, radar-directed tail-defence gun as late as 1980 on the Boeing B-52 Stratofortress, until replaced by 20mm M61 Vulcan Gatling-type cannon on the H model. 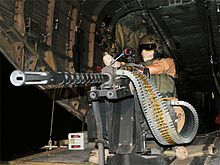 Variants of the AN/M3 are used as flexible door guns or as flexible remotely-controlled armament subsystems on many US Army, Navy, Marine Corps and Coast Guard helicopters, such as the Bell UH-1 Iroquois, Sikorsky UH-60 Blackhawk and variants, Sikorsky CH-53E Super Stallion, Bell OH-58 Kiowa and others. 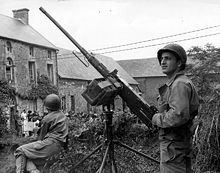 A U.S. soldier in Normandy stands guard with the M2HB installed on a dual-purpose mounting. At the outbreak of the Second World War the United States had versions of the M2 in service as fixed aircraft guns, anti-aircraft defensive guns (on aircraft, ships, or boats), infantry (tripod-mounted) guns, and as dual purpose anti-aircraft and anti-vehicular weapons on vehicles. 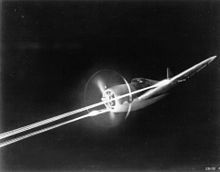 The .50 AN/M2 light-barrel aircraft Browning used in planes had a rate of fire of approximately 800 rounds per minute, and was used singly or in groups of up to eight guns for aircraft ranging from the P-47 Thunderbolt to the B-25 Mitchell bomber, which in the last J-version of the Mitchell could have up to fourteen M2s firing forward for ground attack missions – eight in a solid metal-structure nose, four more mounted in a pair of conformal twin-gunned gun pods on the lower cockpit sides, and two more if the forward dorsal turret's pair of M2 guns were also aimed straight forward. The later A-26 bested this with up to a maximum of 16/18 machine guns, 8 in the nose, four more per wing in flush-mount pods, plus 2 guns in the dorsal turret. In the dual-purpose vehicle mount, the M2HB (heavy barrel) proved extremely effective in U.S. service: the Browning's .50 caliber AP and API rounds could easily penetrate the engine block or fuel tanks of a German Bf 109 fighter attacking at low altitude, or perforate the hull plates and fuel tanks of a German half-track or light armored car. While the dual-purpose mounting was undeniably useful, it did normally require the operator to stand when using the M2 in a ground role, exposing him to return fire. Units in the field often modified the mountings on their vehicles, especially tanks and tank destroyers, to provide more operator protection in the anti-vehicular and anti-personnel role. The weapon was particularly hated by the Germans, whose attacks and ambushes against otherwise helpless stalled motor convoys were frequently broken up by .50 caliber machine gun fire. Vehicles would frequently "recon by fire" with the M2 Browning, i.e. they would fire continuously at suspected points of ambush while moving through areas still containing enemy forces. One vehicle would fire exclusively to the right, the following vehicle to the left, the next one to the right, and so on in order to cover both flanks of the advancing convoy. Besides vehicle-mounted weapons, the heavy weapons companies in a World War II U.S. Army infantry battalion or regiment were each issued one M2 Browning with tripod (ground) mount. Mounted on a heavily sandbagged tripod, the M2HB proved very useful in either a defensive role or to interdict or block road intersections from use by German infantry and motorized forces. Hearing the sound of an M2 could often cause enemy infantry to take cover. There are numerous instances of the M2 Browning being used against enemy personnel, particularly infantry assaults or for interdiction or elimination of enemy artillery observers or snipers at distances too great for ordinary infantry weapons. The M2HB was not widely used in the Pacific campaign for several reasons, including the weight of the gun, the nature of infantry jungle combat, and because road intersections were usually easily outflanked. However, it was used by fast-moving motorized forces in the Philippines to destroy Japanese blocking units on the advance to Manila. The quad mount .50 was also used to destroy Japanese emplacements. The M2HB was used in Korea and Vietnam, and later in both Operation Desert Storm, the Afghan theater of Operation Enduring Freedom and in Iraq. In 2003, U.S. Army SFC Paul Ray Smith used his M2HB mounted on an M113 armored personnel carrier to kill 20 to 50 enemies who were attacking a U.S. outpost, preventing an aid station from being overrun and allowing wounded soldiers to be evacuated, SFC Smith was killed during the firefight and was posthumously awarded the Medal of Honor. The M45 Quadmount was a mounting of four .50 M2HB guns with a single gunner situated behind an armored housing. This was used by U.S. AA battalions, fitted either on a towed trailer or mounted in a half-track carrier (M16 AA half-track). With 200 rounds per gun in a powered tracking mount, the guns proved very effective against low-flying aircraft. The use of four guns adequately compensated for the fact that the individual M2HB's rate of fire (450–550 rounds per minute) was low for an effective anti-aircraft weapon. Towards the end of the war, as Luftwaffe attacks became less frequent, the quad .50 (nicknamed the Meat Chopper or Krautmower) was increasingly used in an anti-personnel role, similarly to the earlier-introduced (1940) and more powerful—but much more difficult to keep well-fed with ammunition when in action—German 20 mm Flakvierling. Snipers firing from trees were engaged by the quad gunner at trunk level; the weapon would cut down and destroy the entire tree, and the sniper with it. The M45 Quadmount was still in use during the Vietnam War. Australian M113 with twin mounted M1919 Browning and M2 Browning Quick Change Barrel machine guns. Commonwealth use of the M2 Browning .50 caliber machine gun (known as the .5 Browning in British and Commonwealth service) was limited in World War II, though from 1942 it was standard armament on US-built AFVs provided under lend-lease such as the M4 Sherman, M7 Priest, M8 Greyhound, or M10 tank destroyer variously used by British, Canadian, Australian, South African and New Zealand units. Nevertheless, the heavy Browning's effectiveness was praised by many British and Commonwealth soldiers in infantry, armored, and ordnance branches. Many commanders thought that the .50 Browning the best weapon in its class, certainly the best of the American weapons, including the M1 Garand and M1 Carbine. In North Africa, after Commonwealth units began to obtain sufficient parts, manuals, gauges, and ammunition for the new weapon, the .50 Browning was increasingly used, eventually replacing the 15 mm Besa, but in Italy it was often deleted from top turret mountings because the mount exposed the operator to low branches and enemy fire. All LRDGs, and some SAS units used the aircraft (AN/M2) version of the gun, while beam/waist-mounted and turret-mounted Brownings were used later in the war in such aircraft as the Short Sunderland and Lancaster bomber. After World War II, the .50 Browning continued to see action in Korea and other theaters, in aircraft, tripod (ground), ground AA (hip-ring), and vehicle mounts. One of its most notable actions in a ground role was in a fierce battle with a nine-man SAS team at the Battle of Mirbat in Oman in July 1972, where the heavy Browning and its API ammunition was used to help repulse an assault by 250 Yemeni Adoo guerrillas, though the more famous weapon from the battle is a 25 pounder gun. A .50 caliber Browning was installed along with a .30 caliber Browning machine gun in each compact one-man turret on M113 APCs used by the Royal Australian Armoured Corps in South Vietnam. The M2HB has been in service with the Israel Defense Forces since its establishment and has served in all of Israel's wars, operations and conflicts. In 2012 the IDF upgraded its M2HB machine guns to the M2HQCB model, with heavy quick change barrel. Today the M2 serves as an infantry crew-served heavy machine gun, as a remote-controlled external coaxial gun on Merkava main battle tanks, as the main weapon on the Samson RCWS and as a secondary weapons on Israeli Sea Corps gunboats and missile boats. USMC M2 fitted with a Leupold CQBSS variable power scope. The M2 machine gun has also been used as a long-range sniper rifle, when equipped with a telescopic sight. Soldiers during the Korean War used scoped M2s in the role of a sniper rifle, but the practice was most notably used by US Marine Corps sniper Carlos Hathcock during the Vietnam War. Using an Unertl telescopic sight and a mounting bracket of his own design, Hathcock could quickly convert the M2 into a sniper rifle, using the traversing-and-elevating (T&E) mechanism attached to the tripod. When firing semi-automatically, Hathcock hit man-size targets beyond 1,800 metres (2,000 yd)—twice the range of a standard-caliber sniper rifle of the time (a .30-06 Winchester Model 70). Hathcock set the record for the longest confirmed kill at 2,250 metres (2,460 yd), a record which stood until 2002, when it was broken in Afghanistan by Canadian Army sniper Arron Perry. It is often stated, sometimes even by military trainers, that it is illegal under the Geneva Convention to use the M2 against enemy personnel since it would cause "unnecessary suffering". As such, most gunners supposedly aim for enemy troops' belt buckles, since those are technically equipment and thus permissible targets. However, there is no provision of the Geneva Convention that has ever been interpreted to forbid the use of the M2 on personnel. The misconception may have arisen during the Korean or Vietnam Wars when U.S. troops were told to use their M2s only on enemy equipment due to shortages of ammunition. It is also possible that a restriction during the latter period limiting the use of the M40 recoilless rifle's .50-caliber spotting gun to equipment only, since the M40 was meant to be used against armor and firing the spotting gun at personnel would have given away the M40's position before it could be used as intended, was mistakenly believed to apply to all weapons of that caliber and given legal justification. An M2HB in the French Foreign Legion's 2nd Infantry Regiment during an exercise. Jungle Infantry soldier of the Brazilian Army mans an M2HB in the Amazon rainforest. The basic M2 was deployed in U.S. service in a number of subvariants, all with separate complete designations as per the US Army system. The basic designation as mentioned in the introduction is Browning Machine Gun, Cal. .50, M2, with others as described below. The development of the M1921 water-cooled machine gun which led to the M2, meant that the initial M2s were, in fact, water-cooled. These weapons were designated Browning Machine Gun, Cal. .50, M2, Water-Cooled, Flexible. There was no fixed water-cooled version. A number of additional subvariants were developed after the end of World War II. The Caliber .50 Machine Gun, Browning, M2, Heavy Barrel, M48 Turret Type was developed for the commander's cupola on the M48 Patton tank. The cupola mount on the M48A2 and M48A3 was thoroughly disliked by most tankers, as it proved unreliable in service. An externally mounted M2 was later adopted for the commander's position on the M1 Abrams tanks. Three subvariants were also developed for use by the U.S. Navy on a variety of ships and watercraft. These included the Caliber .50 Machine Gun, Browning, M2, Heavy Barrel, Soft Mount (Navy) and the Caliber .50 Machine Gun, Browning, M2, Heavy Barrel, Fixed Type (Navy). The fixed types fire from a solenoid trigger and come in left or right hand feed variants for use on the Mk 56 Mod 0 dual mount and other mounts. Huaqing Machinery has made a clone of the M2HB known as the CS/LM6, which was released publicly in 2010 in foreign weapons expo conventions. It was made with a picatinny rail on the receiver in order to have quick installation of various optics. The original M2HB tripod and parts can be used on the CS/LM6. When the M2 was first being designed, John Browning faced two design challenges. With the machine tools available at that time, the dimensions that established the location of the bolt face and the depth of the chamber could not be held tightly enough to control the fit of the cartridge in the chamber. The round can be too tight in the chamber and the gun would not shoot, or be too loose in the chamber, resulting in a stoppage or ruptured cartridge. The other dimension that could not be held close enough was when the firing pin would fall. The solution to these problems was adjustable timing and headspace ("headspace" is the distance between the face of the bolt and the base of the cartridge case, fully seated in the chamber); the operator had to screw the barrel into the barrel extension, moving the barrel toward the bolt face to reach the proper headspace with simple gauges to allow the operator to adjust to the proper dimensions. By the late 20th century, the M2 was the only adjustable headspace weapon in the U.S. inventory. With rising reports of injuries from improperly headspaced weapons, the U.S. military held a competition for a quick change barrel conversion kit with fixed timing and headspace in 1997. Three companies offered kits and Saco Defense won the competition. However, funding was lost before the design could be fully evaluated and the program ended. In 2007, the military found money to start a new competition. Saco Defense had since been acquired by General Dynamics, which won the competition. On October 15, 2010, the M2A1 heavy machine gun was type classified by the U.S. Army. Formerly known as the M2E2, the M2A1 incorporates improvements to the design including a quick change barrel (QCB) with removable carrying handle, a new slotted flash suppressor that reduces muzzle flash by 95 percent, fixed headspace and timing, a modified bolt, and a manual trigger block safety. "Timing" is the adjustment of the gun so that firing takes place when the recoiling parts are in the correct position for firing. When a standard M2 had a barrel change, the headspace and timing had to be manually set. Improper adjustment could damage the weapon and cause serious injury to the user. Fixed headspace and timing reduces risk, and the carrying handle allows the barrel to be switched in seconds. In June 2011, the Army began conversion of M2HB machine guns to M2A1s. The M2A1 was named one of the greatest Army inventions of 2011. As of November 30, 2012, 8,300 built or converted M2A1s had been fielded by the U.S. Army; the program will upgrade the Army's entire M2 inventory of more than 54,000 guns. The U.S. Marine Corps plans to upgrade all of their ground-mounted M2s to M2A1 standard from 2016 to 2018. The first phase of conversions was completed in March 2017, with 3,600 M2A1s planned to be fielded by the Marines in total. The Israel Defense Forces adopted the M2-HQCB (the commercial version of the M2A1) in 2012 as a replacement to the M2HB. An important derivative of the M2 Browning is the Mitrailleuse d´Avion Browning - F.N. Calibre 13,2 mm, more commonly known as the FN Browning M.1939. The FN Browning M.1939 was a heavily modified M2 Browning for aircraft use designed by FN Herstal for export. Their aim was to make a light, reliable heavy machine gun with the same damage output as a 20 mm autocannon. To achieve this they raised the firing rate to 1080 rpm and gave it a more powerful cartridge in form of the 13.2x99 mm Hotchkiss. This cartridge was basically a .50 BMG but with a 13.2 mm bullet (.52 in) and more explosive propellant. Besides the new cartridge they designed a new bullet exclusively for this gun. The bullet was of a high explosive type and was designed to take down a small aircraft with a single hit. Tests showed that it was very effective against both cloth and aluminum skinned aircraft. The M2 machine gun was widely used during World War II, and in later postwar conflicts, as a remote or flexible aircraft gun. For fixed (offensive) or flexible (defensive) guns used in aircraft, a dedicated M2 version was developed called the ".50 Browning AN/M2" or the "12.7 mm AN/M2". The "AN" stands for "Army/Navy", since the gun was developed jointly for use by both services. The AN/M2 designation was also used for other aircraft guns and therefore it is important to write the caliber before the designation. The 12.7 mm AN/M2 had a cyclic rate of 600–800 rounds per minute, with the ability to be fired from an electrically operated remote-mount solenoid trigger when installed as a fixed gun. Cooled by the aircraft's slip-stream, the air-cooled 12.7 mm AN/M2 was fitted with a substantially lighter 36-inch (91 cm) length barrel, reducing the weight of the complete unit to 61 pounds (28 kg), which also had the effect of increasing the rate of fire. The full official designation for this weapon was "Browning Machine Gun, Aircraft, Cal. .50, AN/M2" (Fixed) or (Flexible). The 12.7 mm AN/M2 was used on many aircraft during WWII, as it served as the main aircraft armament in the US military. Most US fighter aircraft were armed with four, six or eight AN/M2 MGs mounted in the wings. Some famous examples being the P-40, P-47 and P-51 for the USAAF and the F4F, F6F and the F4U for the US Navy. For bombers the AN/M2 was used in both flexible and fixed positions for both offensive and defensive use. In flexible defensive positions, the B-17G Flying Fortress heavy bomber was armed with 13x AN/M2 guns in both turreted and flexible positions. In fixed offensive configurations, like on the B-25 Mitchell, commonly carried 6 to 12 fixed guns for strafing. In foreign use the AN/M2 is often just referred to as the M2 Browning. In Sweden it was re-designated 12,7 mm automatkanon m/45 (short 12.7mm akan m/45) meaning 12.7 mm autocannon m/45. Note the Swedish Air Force used a different designation system which recognized the incendiary rounds as grenades, thus it was called autocannon. The AN/M2 was also produced in Finland under the export name Colt MG 53-2. 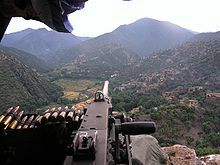 The XM296/M296 is a further development of the AN/M2 machine gun for the OH-58 Kiowa Warrior helicopter. The M296 differs from previous remote firing variants in that it has adjustable firing rate (500–850 rpm), while lacking a bolt latch (allowing single-shot operation). As an air-cooled gun used aboard a relatively slow rotary-wing aircraft, the M296 has a burst restriction rate of 50 rounds per minute sustained fire or 150 rounds per minute maximum while conducting peacetime training requirements; the combat firing rate is unrestricted but a ten-minute cooling period after prolonged firing is mandated to avoid stoppages due to overheating. The GAU-18/A is a lightweight variant of the M2/M3, and is used on the USAF's MH-53 Pave Low and HH-60 Pave Hawk helicopters. These weapons use the M2HB barrel, and are typically set up as left-hand feed, right-hand charging weapons, but on the HH-60 Pave Hawks that use the EGMS (External Gun Mount System) the gun is isolated from the shooter by a recoil absorbing cradle and all weapons are set up as right hand charge but vary between left and right hand feed depending on what side of the aircraft it is on. A feed chute adapter is attached to the left or right hand feed pawl bracket allowing the weapon to receive ammunition through a feed chute system connected to externally mounted ammunition containers holding 600 rounds each. During World War II, a faster-firing Browning was developed for aircraft use. The AN/M3 increased the rate of fire to around 1,200 rounds per minute. The AN/M3 was used in Korea on the F-82 Twin Mustang (the XP-82 mounted a total of 14 AN/M3 machine guns), F-86 Sabre, F-84 Thunderjet and F-80 Shooting Star, and in Vietnam in the XM14/SUU-12/A gun pod. Today, it can be found on the Embraer EMB 314 Super Tucano as designated as M3W with minor modification, which are installed in the wings (2 ea of M3Ws) with 250 rounds each. The M3-series is used by the U.S. military in two versions; the M3M and M3P. The fixed, remote-firing version, the FN M3P, is employed on the Avenger Air Defense System, and is currently used on the OH-58D, augmenting the XM296 .50 cal. machine gun. The M3M flexible machine gun has been adopted by USN under the designation GAU-21/A for use on helicopters. The GAU-21/A is also being used by the U.S. Marine Corps to upgrade from the XM-218/GAU-16 .50 cal. machine gun for the CH-53E, on the UH-1Y Venom, and on the Canadian Forces' CH-146 Griffon via the INGRESS upgrade. The Air Force is looking to replace the GAU-18 on the HH-60G Pave Hawk with the GAU-21 because of its higher 1,100 rpm rate of fire, longer 10,000-round barrel life, and lower recoil through use of a soft mount. Brazil Mtr .50 M2 HB "BROWNING"
Estonia Yes Browning M2 sometimes as Raskekuulipilduja Browning M2 12.7 × 99 mm Browning M2HB. Usually mounted on vehicles, such as the Pasi XA-180 and XA-188, but the tripod version is also in use. Finland No 12,7 RSKK 2005 12.7 × 99 mm Browning M2HB machine gun in Protector remote weapon stations in Patria AMV APCs. 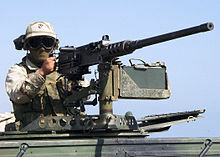 M3M 12.7 × 99 mm Browning M2HB machine gun; Upgraded M2 for use on Commando Helicopter Force and other units as helicopter door guns. DShK, NSV, and Kord 12.7 mm machine guns, Soviet/Russian equivalents. ^ Windrow, Martin (20 Sep 2018). French Foreign Légionnaire vs Viet Minh Insurgent: North Vietnam 1948–52. Combat 36. Osprey Publishing. p. 22. ISBN 9781472828910. ^ Neville 2018, p. 15. ^ Neville, Leigh (19 Apr 2018). Technicals: Non-Standard Tactical Vehicles from the Great Toyota War to modern Special Forces. New Vanguard 257. Osprey Publishing. p. 9. ISBN 9781472822512. ^ Neville 2018, p. 16. ^ "The Coconut Revolution (2001, 50min) (480x360)". YouTube. Retrieved 4 June 2017. ^ FUNKER530 - Veteran Community & Combat Footage (21 June 2013). "50 Cal Gunner Engages Taliban Positions During Ambush". Retrieved 4 June 2017 – via YouTube. ^ Richard, Christophe (2014). "Battle of Abidjan: accurate and timely fires" (PDF). Fantassins. No. 32. p. 28. ^ Neville 2018, pp. 34, 44. ^ War Clashes (30 November 2016). "Syria War 2016 - FSA in Heavy Intense Firefights Against ISIS in Aleppo Governorate". Retrieved 4 June 2017 – via YouTube. ^ Neville 2018, pp. 38, 44. ^ Capdeville, Thibault (2014). "Infantry units fires during OP Serval" (PDF). Fantassins. No. 32. pp. 55–58. ^ "Iraqi Capture Of Saqlawiyah Northwest Of Fallujah From Da'esh". YouTube. Retrieved 4 June 2017. ^ Ruptly TV (22 November 2016). "Yemen: Scores killed as heavy clashes return to Taiz after failed ceasefire". Retrieved 4 June 2017 – via YouTube. ^ WarLeaks - Daily Military Defense Videos & Combat Footage (8 November 2015). "Fierce Confrontation Between Yemeni Houthis And Saudi Arabian Army In Saudi Town Of Rabuah". Retrieved 4 June 2017 – via YouTube. ^ "Arming the Maute Group in Marawi City - The Firearm Blog". thefirearmblog.com. 22 June 2017. ^ "M2 .50 Caliber Machine Gun". GlobalSecurity. ^ "Report: Profiling the Small Arms Industry - World Policy Institute - Research Project". World Policy Institute. November 2000. Retrieved 2010-07-15. ^ Chinn 1951, III pp. 315, 323–334. In 1939, H. Arnold sought a cyclic rate greater that 1000 rounds/minute. The T25E3 gun was standardized as M3, and 2,400 had been made by September 1945. "The standardized basic machine gun fired at the rate of 1,200 rounds per minute." ^ Rottman, Gordon (2008). The Us Army in the Vietnam War 1965–73. Reading: Osprey Publishing. p. 56. ISBN 978-1-84603-239-4. ^ "Contracts for Friday, September 03, 2010". Defense.gov. Archived from the original on May 29, 2011. Retrieved 2011-09-19. ^ "Contracts for Wednesday, July 15, 2009". Defense.gov. Archived from the original on May 29, 2011. Retrieved 2011-09-19. ^ a b Chinn 1951, p. 333, stating "The Germans put a heavily armored plane into service during the closing days of World War I. This act made obsolete for all time the rifle-caliber machine gun for aerial use. Some countries were slower to accept the fact than others but nevertheless it cannot be disputed. The United States was among the first to come to this realization." ^ Chinn 1951, p. 184. Chinn states that the German round was 12.7-mm anti-tank, but it may have been the 13.2mm TuF round. The Germans were working on their MG 18 TuF heavy machine gun. ^ "Major Product Achievements". Fnherstal.com. Archived from the original on 2011-09-27. Retrieved 2011-09-19. ^ "Skylighters, The Web Site of the 225th AAA Searchlight Battalion: AAA Weapons in Focus - The M2 .50-Caliber Machine Gun". Skylighters.org. Retrieved 2008-09-08. ^ Dunlap, Roy F., Ordnance Went Up Front, Samworth Press (1948), pp. 310–311: the official rate during WWII was 450–575 rpm, but it was extremely rare to encounter a M2HB that exceeded 550 rpm. ^ FM 23-65, "Browning Machine Gun Caliber .50 HB, M2". U.S. Department of the Army, December 2002. ^ "Exotic Barrels Part 1: Squeeze Bores | WeaponsMan". weaponsman.com. WeaponsMan. Retrieved 18 July 2018. ^ George, John B., Shots Fired In Anger, NRA Press (1981), p. 404: By World War II, the M2HB had been designated as a dual-purpose anti-aircraft and anti-vehicular weapon for motorized, armored, and infantry divisions; the designation "anti-vehicular" included thin-skinned and lightly armored vehicles, as it was already recognized by 1940 that the .50 M2 AP round would not be useful against modern medium or heavy tanks. ^ Jarymowycz, Roman J., Tank Tactics: From Normandy to Lorraine, Lynne Rienner Publishers (2001), ISBN 1-55587-950-0, ISBN 978-1-55587-950-1, p. 212: The M2HB fitted to tanks and M3 half-tracks was frequently employed against German rearguard forces including snipers and anti-tank teams, often firing into locations merely suspected of hiding such forces (so-called speculative fire). ^ Shore, C. (Capt. ), With British Snipers to the Reich, Boulder: Lancer Militaria, p. 197–198: They especially liked the "hell's brew" of AP, API, and APIT ammunition. ^ Dunlap, Roy F., Ordnance Went Up Front, Samworth Press (1948), p. 153: The New Zealand and South African divisions in particular loved the big Browning, and were frequently encountered trading for spare parts and gauges. ^ "Sniper Rifles". GlobalSecurity. Retrieved 2008-03-24. When a 24-year old Marine sharpshooter named Carlos Norman Hathcock II chalked up the farthest recorded kill in the history of sniping—2,500 yards (a distance greater than 22 football fields) in February 1967, he fired a Browning M2 .50 Cal. Machine Gun. ^ Sgt. Grit (2006). "Marine Corps Sniper Carlos N. Hathcock II". Retrieved 2008-03-24. Viet Cong shot dead by a round fired from a scope-mounted Browning M-2 .50 caliber machine gun at the unbelievable range of 2,500 yards (2,300 m). ^ Keeva, Steven (December 1991). "Lawyers in the War Room". ABA Journal: 55. ISSN 0747-0088. Retrieved April 12, 2016. ^ a b Parks, Maj. W. Hays (January 1988). "Killing a Myth". Marine Corps Association. Retrieved April 12, 2016. ^ Schogol, Jeff (February 9, 2011). "Can you use the .50-caliber on human targets?". Stars and Stripes. Retrieved April 12, 2016. ^ La mitrailleuse Browning FN booklet. ^ La mitrailleuse Browning FN, kapitel XII. Les munitions F.N. calibre 13,2 mm. ^ a b c d e f Beskrivning över 12,7 & 13,2 mm akan m/39 & m/45 (Swedish for: description of 12.7 & 13.2 mm akan m/39 & m/45. The 12.7 mm akan m/45 was the swedish designation for the 12.7 mm AN/M2, as its described in the book.). Krigsarkivet (Swedish military archive): Svenska flygvapnet (The Swedish air force). 1949. ^ "Aircraft Gunnery .50 Cal". browningmgs.com. Retrieved March 9, 2013. ^ 6–6 Cavalry aircrews field new Kiowa Warrior weapons system. US Army. ^ a b c d e f g h i j k l m n o p q r s t u v w x y z aa ab ac ad ae af ag ah ai aj ak al am an ao ap aq ar as at au av aw ax ay az ba bb bc bd be bf bg bh bi bj bk bl bm bn bo bp bq br bs bt bu bv bw bx by bz ca cb cc cd ce cf cg ch ci cj ck cl cm cn Jones, Richard D. Jane's Infantry Weapons 2009/2010. Jane's Information Group; 35 edition (January 27, 2009). ISBN 978-0-7106-2869-5. ^ "Light Calibre Weapons". Adi-limited.com. Retrieved 2008-09-08. ^ Report of the Bahrain Independent Commission of Inquiry (PDF) (Report). Bahrain Independent Commission of Inquiry. 23 November 2011. ^ Berman, Eric G.; Lombard, Louisa N. (December 2008). The Central African Republic and Small Arms: A Regional Tinderbox (PDF). Small Arms Survey. pp. 43–44. ISBN 978-2-8288-0103-8. ^ "Armement" (in French). Armee.lu. Retrieved 2011-06-24. ^ "Geværer". forsvaret.dk (in Danish). Danish Defence. Archived from the original on 2 November 2014. Retrieved 19 October 2014. ^ Kout, Pavel. "Těžký kulomet Browning ráže 12,7 mm M2 HBQCB - Armáda". acr.army.cz. ^ "Puolustusvoimat - Pyörremyrsky - Puolustusvoimien sotaharjoitus 2011" (in Finnish). Puolustusvoimat.fi. 2011-05-13. Archived from the original on 2012-04-27. Retrieved 2011-09-19. ^ "Raskas konekivääri 12.7 RSKK 2005". puolustusvoimat.fi (in Finnish). Finnish Defence Forces. 2013-10-07. Archived from the original on 2014-07-14. Retrieved 2016-02-11. ^ "Battalion Level Weapons". Defence Forces Ireland. Retrieved 26 May 2016. ^ "청해부대 M3M 중기관총 사용 사진". 유용원의 군사세계. 25 January 2015. Retrieved 10 April 2016. ^ Neville 2018, p. 34. 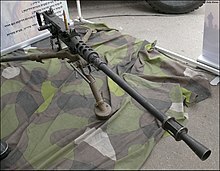 ^ "12,7mm ložmetējs Browning M2HB-QCB" (in Latvian). Archived from the original on 2017-10-11. Retrieved 2014-12-21. ^ "Lietuvos kariuomenė :: Ginkluotė ir karinė technika » Kulkosvaidžiai » Sunkusis 12.7 mm (50) kulkosvaidis M-2 browning" (in Lithuanian). Kariuomene.kam.lt. 2009-12-15. Retrieved 2011-09-19. ^ Abbott, Peter; Rodrigues, Manuel (1998). Modern African Wars 2: Angola and Mozambique 1961–74. Osprey Publishing. p. 18. ^ "HyperWar: Lend-Lease Shipments, World War II (Ordnance)". Retrieved 25 December 2014. ^ Infodefensa.com (20 January 2016). "Los helicópteros Cougar y Chinook incorporarán las nuevas ametralladoras MAG-58, M3M y M-240 - Noticias Infodefensa España". infodefensa.com. Retrieved 4 June 2017. ^ "Kulspruta 88 - Försvarsmakten". Forsvarsmakten.se. 2007-08-23. Archived from the original on 2011-08-11. Retrieved 2011-09-19. Gresham, John D. (December 2001). "Weapons". Military Heritage. Volume 3, No. 3: 22, 24, 26, 28, 30 (John Browning's (M2) .50-caliber). Wikimedia Commons has media related to Browning M2.